Fatayers are Middle Eastern savory pies. Although they're typically filled with meat, the spinach version is quite common but they can also be found filled with cheese and za'atar. Usually small and triangular in shape, the little pies are perfect finger food or appetizers. They also store well in the refrigerator which makes them easy to make ahead and ideal for packing on a picnic or road trip. Depending on the country or region of the Middle East where the fatayers are served, the name might have a variation. 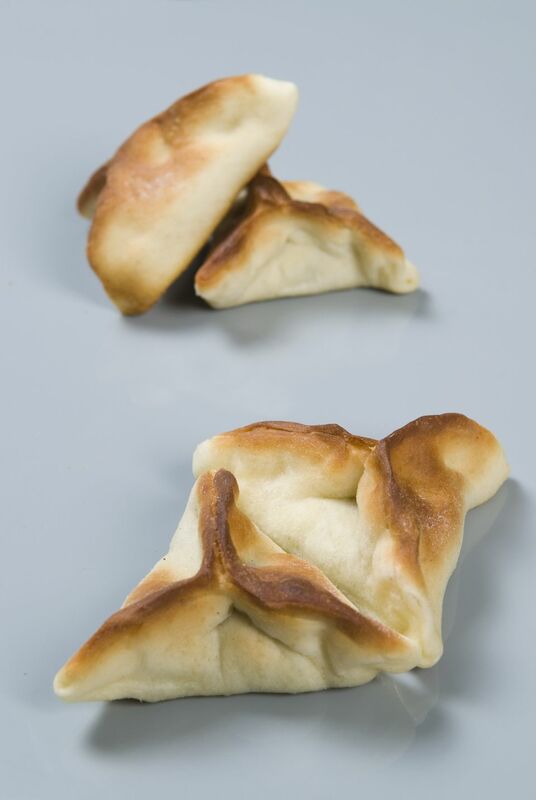 Fatayer bil-sabanegh is how Lebanese spinach versions are often known and fatayer jebneh is the name given to the cheese versions. Spinach fatayer is somewhat reminiscent of the Greek spanakopita but with a few key differences. The Greek version includes feta cheese and is usually wrapped in phyllo dough. Those two ingredients are actually common in Middle Eastern cuisine but the fatayer is most often made with an olive oil based pastry dough. Still, the Middle East is famous for lots of regional and family spins on classic recipes. So it's not uncommon to find different vegetables, herbs and spices used in the filling. Likewise, some people do make them with phyllo or even a yeast dough. However you choose to make them, they're delicious. Add the oil and begin to knead the dough. Once the oil is absorbed, add the warm water. Continue kneading into an elastic dough. Shape the dough into two- inch diameter balls. Soak it in salted water while you chop the vegetables. Rinse the spinach and pat dry thoroughly with paper towel. You can also use a salad spinner if you have one. Combine the washed and chopped spinach, chopped onion, lemon juice, vegetable or canola oil, salt, black pepper, chopped walnuts, and ground sumac. Using a rolling pin, roll each ball of dough into a small circle. Place approximately two teaspoons of the filling into the center of each one. Cover the filling with the dough by lifting up the ends of the circle to the center and forming into triangular shape. Pinch the ends closed with your fingertips. Bake for 10 to 15 minutes on a greased baking sheet or one lined with parchment paper, until golden brown. Allow to cool about five minutes before serving.